The nearer groups are the groups whose distance moduli µ0 30 ( 10 Mpc) can be derived from secondary distance criteria (H II regions, bright stars, luminosity class). These groups in turn serve to calibrate the tertiary distance criteria (magnitudes, diameters) which are used to derive the distances of more distant groups or of southern hemisphere groups for which the secondary criteria are still missing. The apparent distribution of the nearer groups in supergalactic coordinates is shown in figure 3. Available data on each group taken mainly from the Reference Catalogue of Bright Galaxies (abbreviated BGC) are presented in tabular form (Tables 2 and 3). A brief description of individual groups follows. Figure 3. Apparent distribution of nearer group (µ0 30.0) in supergalactic coordinates. EXPLANATION OF COLUMNS.- Cols. (1) and (2), group number and identification. Col. (3), approximate galactic coordinates of center. Col. (4), approximate supergalactic coordinates of center. Col. (5), apparent distance modulus µ and galactic absorption AB in B system. Col. (6), geometric distance modulus µ0 and distance in megaparsecs. Col. (7), approximate major and minor diameters D x d of group in degrees and in megaparsecs. Col. (8), mean corrected velocity V0, number n of objects in mean, and average deviation A.D. from V0. Col. (9), components X, Y, Z of distance in Mpc in supergalactic rectangular coordinate, system. Possible: IC 5332 + DDO 001, DDO 006 dwarfs? * Pair with NGC 0024 in background? Probable: NGC 3077, IC 2574 = DDO 081, A0814 (Ho II) = DDO 050, A0936 (Ho I) = DDO 63. Possible: NGC 2366 = DDO 042, NGC 2403, IC 0342, NGC 1569, IC 0560?, IC 0356? (in UMa-Cam cloud). Other possible (dwarfs): DDO 033, DDO 038, DDO 039, DDO 044, DDO 051, DDO 053, DDO 066, DDO 071, DDO 077, DDO 078, DDO 080, DDO 82, DDO 086, DDO 087, DDO 122, DDO 123, DDO 165. Probable: NGC 4136, NGC 4150, NGC 4244, NGC 4395, IC 4182, A1157 = D105. Other possible (dwarfs): DDO 99, DDO 125, DDO 126, DDO 129, DDO 133, DDO 141, DDO 143, DDO 154. Other members: NGC 5204, NGC 5474; probable: NGC 5959. Possible: NGC 4605, NGC 5907, NGC 6503(? ), A1353 (Ho IV), A1339 (Ho V). Possible dwarfs: DDO 167, DDO 168, DDO 169, DDO 172, DDO 175, DDO 176, DDO 177, DDO 178, DDO 181, DDO 182, DDO 183, DDO 191, DDO 193, DDO 194, DDO 205. * May consist of 2 separate multiplets centered on M51 and M101. Possible: IC 2233 (Sd sp). Possible (dwarfs): DDO 040, DDO 041, DDO 043, DDO 046, DDO 048, DDO 049, DDO 052, DDO 055, DDO 059. Possible: NGC 0672, IC 1727, NGC 1156(?). Probable (dwarfs): DDO 024, DDO 025. Possible (dwarfs): DDO 011, DDO 017, DDO 019, DDO 022, DDO 026. Possible (dwarfs): DDO 056, DDO 057, DDO 060, DDO 061, DDO 062. Probable: NGC 3596, NGC 3666. Possible: NGC 3485, NGC 3506, NGC 3547; dwarfs: DDO 089, DDO 91, DDO 108. Other probable: NGC 3769, NGC 3769A, NGC 3949, NGC 4088, NGC 4111, NGC 4143, NGC 4242, NGC 4485, NGC 4618, NGC 4625, NGC 4627, NGC 4657. Possible: NGC 4025, NGC 4288. Other members: NGC 3239, NGC 3377A, NGC 3412, NGC 3447, NGC 3447A. Probable: NGC 3299, NGC 3300, NGC 3306, NGC 3346, NGC 3357, NGC 3419A. Possible: NGC 3433, NGC 3444, NGC 3466, NGC 3506. Possible dwarfs: DDO 079, DDO 088, DDO 089, DDO 090. Other members: NGC 4203, NGC 4245, NGC 4251, NGC 4274, NGC 4278, NGC 4283, NGC 4314, NGC 4448, NGC 4670, A1244. Possible: NGC 4062, NGC 4146, NGC 4286, NGC 4359, NGC 4375, IC 3330. Possible (dwarfs): DDO 101, DDO 117, DDO 131, DDO 133, DDO 143, DDO 154. Possible: IC 4710, IC 4713, IC 4714. EXPLANATION OF COLUMNS.- Col. (1), NGC or other identification. Col. (2), revised type. Col. (3), DDO luminosity class. Col. (4), standard ``face-on'' magnitude B(0). Col. (5), standard ``face-on'' diameter D(0) (in arcmin). Col. (6), corrected redshift V0 (km s-1). Col. (7), absolute magnitude corresponding to B(0). Col. (8), log linear diameter corresponding to D(0) (in kiloparsecs). G1. Sculptor Group (µ = 26.9, = 2.4, V0 = 220). This nearest of all nearby groups is a loose association of six or seven late-type spirals Sc to Sm (NGC 0045, NGC 0055, NGC 0247, NGC 0253, NGC 0300, NGC 7793, and perhaps IC 5332) distributed at the rim of a 20° ring near the south galactic pole (de Vaucouleurs 1956a, 1959). The fainter, smaller member NGC 0045 also has the largest velocity, and it may be on the far side of the group. If the group had a depth along the line of sight equal to its apparent diameter, the individual distance moduli could have a range of up to µ = 0.7 mag from, say, 26.7 to 27.4. However, the nearly circular outline suggests a flat structure seen face-on. The group has not merely no central concentration, but actually an empty region in its center. This peculiar structure is apparent in several other loose groups of spirals. It suggests the possibility that such groups are the galactic equivalent of old expanding stellar associations (de Vaucouleurs 1959). The maximum dimensions of the group, 25° x 20° = 1.0 x 0.8 Mpc (or 20° x 20° if IC 5332 is excluded), are of the same order as the Local Group limited to its brighter members. The velocity range is about 400 km s-1 (+95 to +489 km/sec), or 160 km/sec (+95 to +258 km/sec) if NGC 0045 is excluded. Detailed photometry, continuum, and HI radio data, optical and radio rotation curves, and mass estimates are available for several of the brighter members (de Vaucouleurs 1961b; de Vaucouleurs and Page 1962; Epstein 1964; Robinson and van Damme 1964; and chap. 3 of this volume). An HI cloud sharing the velocity of NGC 300 has been reported by Shobbrook and Robinson (1967) in a position several degrees from the galaxy where no optical luminosity can be seen. G2. M81 Group (µ0 = 27.0, = 2.5, V0 = 160 km/sec). This well-known group centered on the M81-M82 pair in Ursa Major includes several late-type spirals and dwarf irregular satellites: NGC 2976, NGC 3077, IC 2574 (= DDO 81), A0936 (Ho I = DDO 63), and A0814 (Ho II = DDO 50) (Holmberg 1950). Several large nearby spirals including NGC 2366, NGC 2403, and possibly NGC 4236 have comparably low velocities and may be outlying members of the group. NGC 2403, NGC 2366, A0814, and two or three other dwarfs (DDO 44, 51, 53) may in fact form a subgroup in a larger cloud extending into Camelopardalis and including also the low-latitude, obscured group formed by NGC 1560, NGC 1569, IC 342, IC 356, Maffei 1 and 2, (1) and possibly several dwarfs (DDO 33, 38, 39). This cloud may be interrupted by the galactic absorption belt. 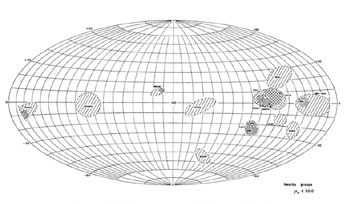 The overall dimensions of the cloud 40° x 20° = 1.8 x 0.9 Mpc are typical of these formations (compare UMa I, Virgo II, Leo II, etc. ); the restricted M81 group is only 13° x 7° = 0.6 x 0.3 Mpc, or somewhat smaller than the Local Group. Because of the large range of galactic latitudes covered by the UMa-Cam Cloud the apparent modulus varies from 27.3 (A = 0.3 mag) for M81 to 28.3 (A = 1.2 mag) for IC 342. The velocity range is about 350 km s-1 (-26 to +322 km/sec). G3. Canes Venatici I Cloud (µ0 = 27.9, = 3.8, V0 = 342 km/sec). A loose cloud of low-velocity objects may be isolated in the foreground of several more distant, overlapping groups and clouds in the UMa-CVn-Coma area. This whole region is described as the CVn cluster or M94 group by van den Bergh (1960d), who points out that many dwarfs are concentrated in this area (van den Bergh 1959); Sersic (1960) describes a subset as the UMa I group and another as the UMa II group (both of which, however, are all within the boundaries of CVn). A detailed comparison of luminosities, diameters, velocities, H II regions, and brightest stars supports the latter interpretation. After much searching and with some hesitation in borderline cases, the following objects were isolated as members of the foreground CVn I cloud (or restricted M94 group): NGC 4136, NGC 4150, NGC 4214, NGC 4244, NGC 4258, NGC 4395, NGC 4449, NGC 4736 (M94), IC 4182, A1157 (= DDO 105), and possibly NGC 4826 (M64). Other possible dwarf members include DDO 99, 125, 126, 129, 133, 141, 143, and 156. All members are spirals of type Sb or later and Magellanic irregulars. The overall dimensions of the cloud are 28° x 14° = 1.9 x 0.9 Mpc (including NGC 4826), and the velocity range is about 300 km s-1 (236-530). Radio continuum and HI emission has been detected in several members, including NGC 4214, NGC 4244, NGC 4258, NGC 4449, NGC 4736 (Heeschen and Wade 1964; Epstein 1964), and optical rotation curves and mass estimates are available for NGC 4258, NGC 4736, etc. (see chap. 3). G4. NGC 5128 Group (µ0 = 28.0, = 4.0, V0 = 319). Several large southern galaxies having low velocities (range 271-410) may form a loose group or chain centered on NGC 5128, and including NGC 4945, NGC 5102, NGC 5236, NGC 5253, and possibly NGC 5068 (de Vaucouleurs 1956a, Sersic 1960b). Two (NGC 5102 and perhaps NGC 5128 = Cen A) are lenticulars, three are late-type spirals Sc-Scd, and one (NGC 5253) is peculiar, possibly an I0 irregular (the BGC classification Imp is incorrect). The overall length of the chain is 30° = 2.1 Mpc or 20° = 1.4 Mpc (excluding NGC 5068 which has the highest velocity). The velocity range is, however, only 140 km/sec (271-410 km/sec). Even if this chain does not form a physical (bound) group, it is useful to obtain some estimate of the distance of NGC 5128. Because of the large range of galactic latitudes covered the apparent modulus varies from 28.2 (A = 0.3) for NGC 5068 to 28.8 (A = 0.8) for NGC 4945. In addition to the extensive literature on NGC 5128 (see BGC for references), some optical and radio emission data are available for NGC 4945 and NGC 5236 (de Vaucouleurs 1964; Epstein 1964). G5. M101 Group (µ0 = 28.3, = 4.6, V0 = 508 km/sec). This is a traditional group, but its membership is somewhat uncertain. It is included by van den Bergh (1960d) in his extended M94 group, but Holmberg (1950) and Sersic (1960a) make it a separate group. An analysis of luminosities, diameters, HII regions, and velocities, as well as the distribution on the sphere, supports the latter view. The major members, then, are M101 (NGC 5457) and its satellites NGC 5204, NGC 5474, NGC 5585 , and the wide pair formed by M51 (NGC 5194 and companion NGC 5195) and M63 (NGC 5055); a probable member is NGC 5949 and possibly some outlying systems including NGC 4605, NGC 5907, NGC 6503, A1353 (Ho IV), and A1339 (Ho V). Many dwarfs are concentrated in this region including DDO 175, 185, 186, 191, 193, and 194 around M101, and DDO 167, 168, 169, 172, 176, 177, 178, 181, 182 and 183 around M51-M63. Except for NGC 5195 (type I0), all bright members of the group are spirals of type later than Sb and dwarf Magellanic irregulars. The velocity range is 240 km s-1 (395-634). The overall dimensions of the group are 23° x 16° = 1.8 x 1.3 Mpc, and again there is no central condensation. In fact, the group consists mainly of two subgroups centered on M101 and M51, each about 10° x 7° = 0.8 x 0.6 Mpc and are separated by some 10° = 0.8 Mpc. The separation between the M31-M33 and Galaxy-LMC subgroups in the Local Group is about 0.7 Mpc. Detailed photometric, spectroscopic, and radio data are available for M51, M63, and M101 (Holmberg 1950; Epstein 1964). G6. NGC 2841 Group (µ0 = 28.9, = 6.0, V0 = 589). Several large spirals near the border of Ursa Major and Lynx have low velocities (range 422-751) and may form a loose group including NGC 2841 and NGC 2681 as the brightest members; the loose triplet of late-type spirals NGC 2500, NGC 2541, NGC 2552; and the close pair formed by NGC 2537, a peculiar Magellanic irregular, and IC 2233, an edge-on Sd (the L classification in BGC is an error). Several dwarf systems in the area, including DDO 040, DDO 041, DDO 043, DDO 046, DDO 048, DDO 049, DDO 052, DDO 055, and DDO 059, are possible members. The overall dimensions 15° x 7° = 1.6 x 0.8 Mpc are normal. If the adopted modulus is correct, only one member (NGC 2841) is brighter than -18, but NGC 2681 is at MG = -17.9. Little detailed information is available for these galaxies, and there are no positive radio data. G7. NGC 1023 Group (µ0 = 29.0, = 6.3, V0 = 625 km/sec). Several large spirals of type Sc and later including NGC 0925, NGC 1003, NGC 1058, and IC 0239 are clustered around the bright lenticular system NGC 1023 in low galactic latitudes at the border of Perseus and Andromeda. The edge-on Sb system NGC 0891 and the close pair of late-type spirals NGC 0672, IC 1727 (V0 = 496 and 518 km/sec) are probable or possible outlying members. NGC 1156 (V0 = 497 km/sec), a Magellanic irregular some 20° away, is another possible outlying member. The velocity range is 245 km/sec (496-741 km/sec). The group is at the edge of the galactic absorption belt (which may conceal some members in lower latitudes), and the apparent modulus varies from 29.3 for NGC 0672 (A = 0.33) to 29.6 for NGC 1003 (A = 0.64). 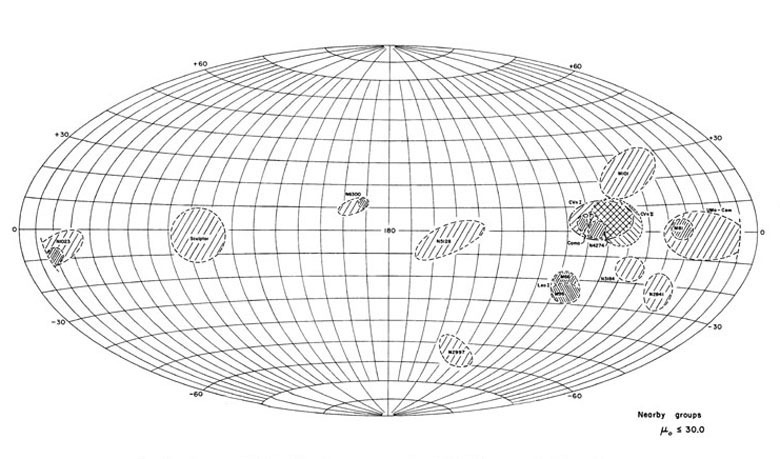 Several dwarf irregulars are probable (DDO 024, DDO 025 shown in The Hubble Atlas of Galaxies, plate 39) or possible (DDO 011, DDO 017, DDO 019, DDO 022, DDO 026) members. The overall dimensions of the group 20° x 10° = 2.2 x 1.1 kpc (including NGC 0672) are rather large, but the diameter of the core around NGC 1023 is only 8° = 0.9 Mpc. There is little detailed optical information and no positive radio data for these galaxies (except for 21 cm line and continuum emission for NGC 0891), although two of the brightest supernovae appeared in NGC 1003 and NGC 1058. G8. NGC 2997 Group (µ0 = 29.4, = 7.6, V0 = 534 km/sec). A loose group, consisting of one lenticular NGC 2784 and several large late-type spirals including NGC 2763, NGC 2835, NGC 2848, NGC 2997, may be isolated in low galactic latitudes at the border of Hydra and Antlia in the foreground of the distant Hydra cloud (µ0 = 31.5, V0 = 2074). Redshifts are known for only two objects (NGC 2784, NGC 2835) but the large diameters and luminosity classes of the others confirm the existence of a nearby group. The overall dimensions are 14° x 8° = 1.9 x 1.1 Mpc. Several dwarf systems including DDO 56, 57, 60, 61, 62 are in this area. The large Magellanic irregular NGC 3109 (V0 = 130), which lies about 5° north following NGC 2997, is probably an isolated foreground object. There is very little optical or radio information on members of this group which is one of the only two nearby groups at supergalactic latitudes greater than 50°. G9. M66 Group (µ0 = 29.4, = 7.6, V0 = 592). This is the well-known compact triplet of spirals including M65 (NGC 3623), M66 (NGC 3627), and NGC 3628 together with several outlying systems including probably NGC 3593, NGC 3596, and 3666, and possibly NGC 3485, NGC 3489, NGC 3506, and NGC 3547. The velocity range is 300 km s-1 (429-730), and the overall dimensions are 7° x 4° = 1.0 x 0.6 Mpc. Only a few dwarfs including D89, 91, and 108 are in this area, but NGC 3628 has an extremely faint companion or appendage discovered by Zwicky. The M66 group partly overlaps in both projection and velocity range with the richer and larger M96 group (G11) with which it is often combined to form an enlarged Leo group (e.g., as in Humason, Mayall, and Sandage 1956) which will be denoted here as the Leo I cloud. Apart from optical rotation curves for M65 and M66 (cf. chap 3), little detailed information is available for the others outside that referenced in BGC. G10. Canes Venatici II Cloud (µ0 = 29.5, = 8.0, V0 = 747 km/sec). This is part of the complex region described as the Canes Venatici (M94) cluster by van den Bergh (1960d) and as the UMa II group by Sersic (1960a). A detailed analysis of magnitudes, diameters, H II regions, luminosity classes, and velocities over the whole region indicates that a dozen bright objects (NGC 3769, NGC 3769A, NGC 3949, NGC 4051, NGC 4088, NGC 4111, NGC 4143, NGC 4242, NGC 4485, NGC 4490, NGC 4625, NGC 4618), mainly late-type spirals and irregulars (NGC 4111 and 4143 are lenticulars), form an elliptical core area measuring 15° x 8° = 2.1 x 1.0 Mpc. The overall dimensions of the cloud are increased to 22° x 12° = 3.0 x 1.6 Mpc if several probable or possible outlying members such as NGC 3675, NGC 4627, NGC 4631, NGC 4656-4657, NGC 4800, and the dwarf systems NGC 4025, NGC 4288 are included. The assignment of outlying objects to this cloud rather than to other overlapping or adjacent clouds or groups (CVn I, Coma I, M101) is to some extent a matter of interpretation. This is especially true of the many dwarf galaxies noted by van den Bergh (1959) in this general area (see fig. 6); it is not possible without further detailed study to determine which cloud they belong to. Several of the brighter objects in the CVn II cloud have been the subject of fairly detailed optical and radio investigations (for references see BGC and chap. 3). G11. M96 Group (µ0 = 29.6, = 8.3, V0 = 741 km/sec). This is the major condensation in the Leo I Cloud; it is centered on a dense core (3° x 1°.5 = 0.4 x 0.2 Mpc) including NGC 3351 (M95), NGC 3368 (M96), NGC 3377, NGC 3377A, NGC 3379, NGC 3384, and NGC 3412. Other probable and possible members listed in Table 3 cover an area 11° x 7° = 1.6 x 1.0 Mpc. Several dwarfs including DDO 079, DDO 088, DDO 089, DDO 090 are other possible members. The morphological types show greater variety than nearer groups, ranging from giant ellipticals (NGC 3377, 3379) and lenticular (NGC 3384) to late-type spirals and Magellanic irregulars. As the nearest of the well-mixed groups, the M96 group is one of the best fields for the calibration of distance indicators applicable to E and L systems (NGC 3377 and NGC 3379 are rich in globular clusters). The velocity range is 310 km/sec (593-904 km/sec), rather small for a dense group. Extensive photometric and spectroscopic studies have been made of several of the bright members, especially NGC 3379, for which there is also a mass estimate from velocity dispersion (see references in BGC). There are as yet no positive radio data, except marginal continuum emission from M95 and M96. G12. NGC 3184 Group (µ0 = 29.9, = 9.6, V0 = 629 km/sec). A few late-type spirals with fairly large diameters and consistent velocities (range: 418-832 km s-1) stand out in Leo Minor in the foreground of more distant clouds. The four listed in Table 3 cover an area 10° x 5° = 1.7 x 0.8 Mpc. Two more (NGC 3344 and NGC 3510) 10° south of the group have velocities in the same range and might be included as possible members. There is a remarkable paucity of DDO dwarfs in this area, and the reality of the group is questionable. There is also very little detailed optical or radio information on the galaxies in this group. G13. Coma I Cloud (µ0 = 29.9, = 9.6, V0 = 944 km/sec). This is an elliptical area 11° x 5° = 1.8 x 0.5 Mpc enclosing two main condensations, the denser NGC 4274 group, and a loose grouping around NGC 4565. The NGC 4274 group (van den Bergh 1960a; Sersic 1960a) includes NGC 4245, NGC 4251, NGC 4274, NGC 4278, NGC 4283, NGC 4314, NGC 4414, NGC 4448, and possibly NGC 4062, NGC 4146, NGC 4203, NGC 4359, IC 3330, and other insufficiently documented objects; the group has a 3° = 0.5 Mpc core surrounded by scattered objects over a 6° = 1.0 Mpc region. Morphological types are well mixed, including a pair of giant ellipticals (NGC 4278, 4283). The grouping around NGC 4565 includes also NGC 4494, NGC 4559, NGC 4725, and A1244 (the low-velocity anonymous spiral in the outskirts of the great Coma I cluster) and probably some other less well-documented objects. The dimensions of this grouping are 11° x 5° = 1.8 x 0.8 Mpc. Velocities in the NGC 4274 group tend to be lower (range: 622-1078; mean: 829) than in the NGC 4565 area (range: 876-1305; mean: 1134), but there is considerable overlap. A number of DDO dwarfs listed in Table 3 are other possible members of the Coma I cloud. Except for some photometry of NGC 4494 and 4565, there is surprisingly little detailed optical or positive radio information on members of this cloud in spite of the favorable location near the north galactic pole (see references in BGC). G14. NGC 6300 Group (µ0 = 30.0, = 10.0, V0 = + 1270 km/sec). Three large obscured spirals at low galactic latitudes in Ara - NGC 6300 and the pair NGC 6215-6221 - may be the brighter members of a loose group partly hidden by the absorption belt; the pair of late-type spirals IC 4710, IC 4713, and perhaps IC 4662A and IC 4714 are other possible members. The large, low-velocity Magellanic irregular IC 4662 (V0 = + 237 km/sec) is clearly in the foreground. The length of the chain is 10° = 1.7 Mpc. Because of the range of galactic latitudes the apparent modulus varies from µ = 31.1 for NGC 6215-6221 (A = 1.1 mag) to 30.8 for NGC 6300 (A = 0.8) and 30.6 for IC 4710-4713 (A = 0.5). The large absorption correction and poorness of the group make the distance modulus quite uncertain. 1 For more recent discussions of this group, see Bottinelli et al. (1971, 1972). Back.